Our hills bless us with verdant views and curse us with treacherous mudslides. They divide our communities and unite us in pride of place. Do we risk taking them for granted? Consider the lay of the land. Sometimes, when I’m driving into Cincinnati from Dayton, I watch the horizon line to the south and feel that quickening of the senses that coming home can impart. The land stretches across the woods and fields (and behind the housing tracts and shopping malls) into a gentle upward slope until the sky claims it, and just when it looks like nothing could lie beyond, the hills come into view again. Gentle, rolling, densely wooded and, in their way, welcoming. When I see them, I know I’m back. Many of our neighborhoods—Mt. Airy, Bond Hill, College Hill, Kennedy Heights, Mt. Lookout, Mt. Washington, Pleasant Ridge, and Winton Hills, to name a few—take their names from their elevations. Many of our parks—Ault, Alms, Eden, Jackson Hill, Mt. Echo, and Mt. Storm—get their character from their views. Our hills provide pedestals for some of our most familiar landmarks: Holy Cross-Immaculata Church on Mt. Adams, Hughes Center High School in Clifton Heights, St. Francis de Sales in Walnut Hills (the visibility of its steeple from long distances is remarkable), the Twin Towers retirement community in College Hill. Rarely, perhaps, was a state official more prescient. This year’s mudslides in Mt. Auburn, along Columbia Parkway, and in Price Hill are only the latest in a long and frustrating struggle between the forces of growth and the forces of gravity. When the debacle on Elberon Avenue burst forth in January, Richard Pohana, the geotechnical engineer for the city, arrived early one morning to see the earth move “probably 50 feet in two hours.” It was a remarkable sight, of course. But for Pohana, who has been keeping an eye on the city’s hillsides for 24 years, it was déjà vu. I have always loved our hills. I can remember, as a reporter for The Cincinnati Post in the early 1970s, driving north on Hamilton Avenue and feeling slightly sickened at the sight of the new Ashtree Shopping Center freshly carved from the slope on the west side of the road (today, the complex has been taken over by the Greater New Bethlehem Temple Apostolic Church). The raw cut behind the low-slung buildings spoke volumes: The shopping center didn’t belong there. Heavy equipment was able to put it there. No regulations existed to stop it. Things are better now. We have the nonprofit Hillside Trust, dedicated to the preservation of our hills and views. There are some regulations. There is awareness of the importance of the natural environment and the domino-like consequences of playing fast and loose with it. Still, it never hurts to be reminded. Drive around the city and look—really look—at the hillsides. Ask yourself: Whose sensibility is at work here? John Tallmadge’s or John Cleves Symmes’s? When nature is good to us, and blesses us with plenty, our default behavior is to take it for granted. Too often, we abuse it. Here’s a cautionary thought that’s not entirely irrelevant: The last passenger pigeon died in the Cincinnati Zoo in 1914. I asked Hunda how our hills were created. The answer was complex, involving an ancient sea that covered Southwest Ohio 450 million years ago; a “super-continent” called Pangea, which, when formed, thrust to the surface the Ordovician rock left under the great sea (we see this rock around us today); an ancient river, the Teays, which flowed north through today’s Mill Creek Valley about two million years ago; and three periods of “glaciations,” the last of them reaching back only 18,000 years. In laymen’s terms, the great sea receded after several hundred million years, most likely related to the forces of plate tectonics and glaciation. Pangea, the super-continent, uplifted and broke apart; for the next 240 million years, this region was a terrestrial environment, exposed to the actions of erosion. This resulted in the Lexington peneplain that now surrounds us—that vast, almost flat land mass to which the horizon lines of all our hills conform. The Teays River, a gigantic stream, cut into the peneplain and gave birth to the two Miami Rivers and the Mill Creek. In doing so, it also began carving our hills. The three glaciers that followed—and this is the critical part—each bulldozed the earth, pushing before it a pile of ice, rocks, and debris. At its southernmost point, the glacier formed a “moraine”—in effect, a dam pushing the water of the Teays and subsequently forming river valleys (like the modern Mill Creek Valley) into lakes. As the ice melted and the lakes overflowed their banks, the hills that had begun to take shape with the Teays deepened. They grew from roughly 150 feet deep to their current 350 to 400 feet above the Ohio (which is at an elevation of 500 feet). The soil left on the surface was the clay that became the inspiration for Rookwood Pottery and the scourge of local gardeners. It is no friend to builders, either. And indeed, it hasn’t. Cincinnati’s history of mudslides is long and messy. Twentieth century records include both gargantuan individual slides and miserable periods of multiple slides prompted by unusually wet weather. Thus we had 87 acres near the Riverside Harrison School, on the west side, displaced in 1926; the first major documented slide on Columbia Parkway in 1933; memorable problems associated with reconstruction of the Waldvogel (Sixth Street) Viaduct in 1950; and due to construction of I-75, displacements near Cincinnati State that cost more than $400,000 to remedy in 1956 and 1957. Sixteen years later, construction of I-471 triggered a collapse of lower Mt. Adams from below Oregon Street to the base of the hill. If slide activity is severe enough, as it was in 1973, 1996, and this year, the area affected can qualify for Federal Emergency Management Agency (FEMA) assistance, which means the federal government will handle 75 percent of the clean-up cost. Ohio Emergency Management handles another 12.5 percent, and the city picks up the remainder. Between 1973 and 1978, Hamilton County devoted a total of $31 million to mudslide remediation—excluding the $30 million, give or take, required to shore up Mt. Adams. In 1996, damages from landslides in Hamilton County exceeded $10 million. Near Richard Pohana’s City Hall office is a fascinating city map. The areas prone to serious slides are inked in red—so many of them, they look like flames on the brink of a conflagration. But Pohana doesn’t see it like that. “We have come a long way since the 1970s; other cities are just catching up to where we are now,” he says. “Most of the roads that should be reinforced on the downside against erosion are.” The city now has 1,837 retaining walls holding back the earth. Joined together, they’d make a bulwark 59 miles long. Arguably, the most significant year in the history of Cincinnati landslides was 1973. In addition to a section of Mt. Adams giving way, major slides occurred along Columbia Parkway, the bend in Clifton Avenue, and on Hillside Avenue in Delhi Township. The combined disasters led to the passage of a 1974 cut-and-fill ordinance mandating that anyone wishing to build on the hillsides submit the plan to the city’s zoning department—a measure that environmental activists had lobbied for for years. The second significant milestone in the effort to remediate landslides was an agreement in 1989—the year Pohana came to City Hall—to earmark funds for landslide repair and the kind of capital improvements that would handle slides before they happened, such as reinforcing retaining walls and inspecting them regularly. Approximately $1 million annually was set aside; recently, with the city’s budgetary problems, the sum has dropped to more like $650,000 annually. Even in its diminished distribution, Pohana notes that the money has made all the difference. On a warm day in January, I walk through the streambeds and ravines of LaBoiteaux Woods in College Hill with John Tallmadge. Trees surround us as far as the eye can see, brown and leafless in the winter light. 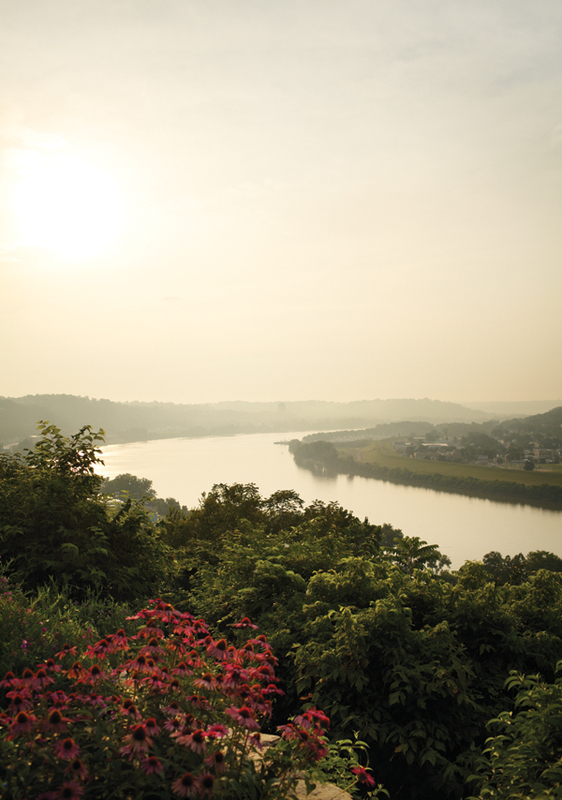 Tallmadge wants to show me first-hand the wildness within the city that is the gift of our hills. A surprising amount of it, he says, is not in neighborhood parks but in nature preserves and natural areas such as the north end of Spring Grove Cemetery, where we are headed now. That much I know. In Tim Agnello’s master thesis is a pre-1930 photograph of Bald Knob, a rock formation at the north end of Price Hill. You can’t take a photo of it today: It was used for fill to create the foundation for Union Terminal. At the time of the picture, Bald Knob had something of the presence of Mont Saint-Michel—a rock of castle-like proportions towering in the middle distance behind (and slightly to the right of) the site of the proposed train station. Today, it is a low plateau at best. To create the base that supports the Union Terminal foundation, limestone was removed from Bald Knob. To infill portions of the land surrounding the terminal, its shale was used. In all, approximately 4 million cubic yards of limestone and shale were stripped from the huge rock (with another 2 million taken from other locations to infill the valley in the vicinity of Union Terminal). Depending on your sensibility, it was either a wise use of natural resources or blatant environmental degradation. I tell the story to Tallmadge with a bit of a too-bad-it-had-to-happen spin, but he is sanguine. “People are going to change landscapes,” he says. “It’s inevitable. People have been here for 200 years. There are more of us than ever, and that isn’t going to change.” We are hiking now beneath a power line that runs the length of the county; the ground beneath us is grassy, the space open. We crest a hill above Gray Road, look southeast across the Mill Creek Valley, and there, in the distance, are the high-rises of East Walnut Hills and Hyde Park, the towers of UC and, sure enough, the St. Francis de Sales steeple. Behind us, for a considerable trek, it’s all woods and steep descents. What is more amazing, I think, is that despite all the people and the urban pressures, and all the damage we have done to them, our hillsides remain magnificent. I recall the previous week, when I stood on the observation deck of Carew Tower with Dan Hurley and looked at the panorama to the north. The thickets of bare-limbed trees and the endless brick buildings rippled across the ridges like a topographical map come to life. While we were there, Hurley cited the locations of the five inclines, built in the late 1800s and dismantled before the mid-1900s. He pinpointed the pathetic remains of Bald Knob. He nodded toward the Mill Creek Valley, reminding me that it was the only natural way to access the city from the north until I-71 was cut into the shale some 50 years ago. I listened, and I learned, but mostly I looked. In this city where we can be so preoccupied with river views, I wasn’t seeing a drop of water. I was fixated on the hills. *California Woods, Winton Woods, Caldwell Preserve, and Ault Park all contain stands of old-growth forest.